Funny how a little thing like a few decades can dynamically change style and expectations. Last generation's tweet was likened to an adorable yellow bird constantly trying to escape and outsmart a speech-impaired house cat. Now, of course, it has grown from two characters to up to 240 if you've managed to be famous enough. And, there are plenty of other examples. Geeks and jocks are now often the same person! 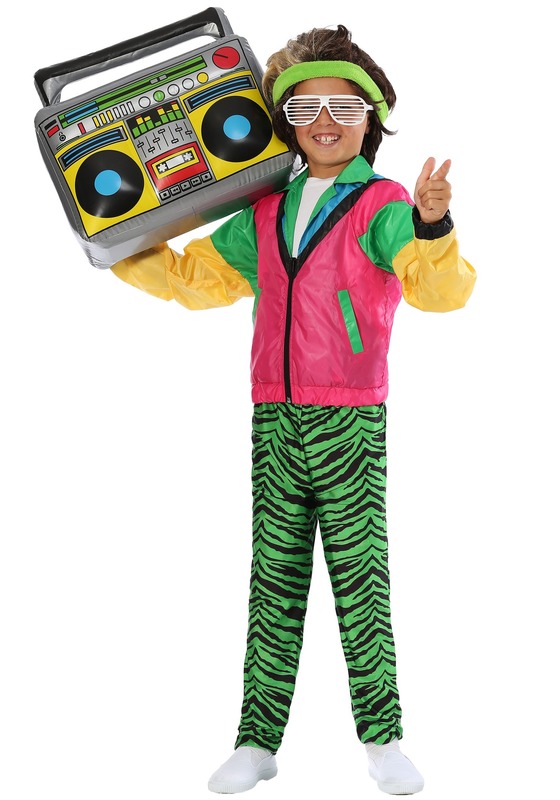 Before it is too late, hop back to the past and show your kiddo how fun the '80s were with this Boy's 1980s Jock Costume. This exclusive look features polyester, polyester, and just a bit more of it! But, the colors are going to make it seem like you're getting something rarer. The tiger stripe green and black pants fit with elastic waist and will practically glow as your kiddo struts his stuff and shows off the bright and contrasting colors of the jacket. Naturally, no 80s look could be complete without the featured terry cloth sweatband! Let your kid have a great thrill with this trendy look from over thirty years back. This stylish 1980s Jock Costume will give a splash of color and confident style that will have all the neighborhood either grinning with nostalgia or wide-eyed with curiosity. Either way, we're talking about an epic time!